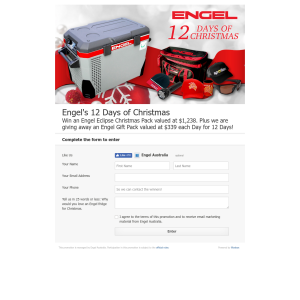 Win an Engel Eclipse Christmas Pack valued at $1,238. Plus we are giving away an Engel Gift Pack valued at $339 each Day for 12 Days! PROMOTIONAL PERIOD: Wednesday 7 November 2018 at 9am AWST until Tuesday 27th November 2017 at 8am AWST. ELIGIBILITY: Entry is open to Australian residents aged 16 years or older. The promoter reserves the right to verify the eligibility of each entrant. Employees of Engel Distribution and Premiere Productions including their immediate family are not eligible to enter. MAJOR PRIZE: Engel Eclipse 38L fridge/freezer MR40F RRP $899 plus an Engel Gift Pack including an Engel Christmas Gift Pack valued at $339.30. MINOR PRIZE: Engel Christmas Gift Pack including Engel Spotters Sunglasses, Engel Beanie, Engel Spotters Cap, Engel Country Stubby Holder/Cap/Icy Pole Holder Pack, Engel Fishing/Cooler Bag and Engel Torch valued at $339.30. PRIZE POOL: 1x Major Prize and 12x Minor Prizes valued at $5,309.90. ENTRY: No purchase or payment is required to enter the Promotion. Entrants must enter the Promotion via the Engel Facebook Page by completing all of the required fields and selecting the ‘Enter’ button within the Promotional Period. This includes agreeing to the terms of the promotion and to receive marketing material from Engel Australia. After submitting the required information on the entry form, the Entrant will receive one (1) entry into the judging. Entry to the promotion is restricted to one entry per person. Multiple or automated entries will be disqualified. Entrants can un-subscribe from marketing material at any time following the promotional material by opt-ing out via the link at the bottom of any electronic communications. WINNER SELECTION: All entries completed and submitted in accordance with these Terms and Conditions will be judged at the Promoter's address, 6 Ernest Clark Road Canning Vale WA 6155. Prize winner(s) will be selected on Friday, 30 November 2018. Winner(s) will be selected by a panel of judges appointed by the Promoter. The Winner(s) will be the entrant(s) whose entry fulfills the entry criteria and whose answer is judged to be the most creative and original from all entries received. This is a game of skill. There is no element of chance in the judging of the Promotion or determination of the Winner. WINNER ANNOUNCEMENT: Prize Winners will be notified by email and announced on the Engel Facebook Page. Winner Announcements will take place from the 1st December until 13th December, with the major prize winner being the last announcement. PRIZE CONDITIONS: The Prize is non transferable and cannot be exchanged or redeemed for cash. The Prize will be forfeited if for any reason, the Prize Winner cannot accept the Prize within three (3) months of notification, and a redraw will take place on 13th March 2019 (with the winner announcement taking place on the Engel Australia Facebook Page). Prize includes postal delivery to an Australian address to be nominated by the Prize Winner. Any ancillary costs associated with the Prize are not included unless specified. PUBLICITY: The Promoter may use Prize Winners’ details for promotional purposes unless a written request is made otherwise. No payment will be given for any publicity achieved as a result of this Promotion. RELEASE: To the fullest extent permissible by law, each entrant including the Prize Winner and any person partaking in any component of the Prize, releases and indemnifies the Promoter from any claim, loss, damage, injury, expense (including any claim for legal expenses), cost or charge sustained or in any way incurred in connection with the Prize or Promotion or participation in the Prize or Promotion. The Promoter’s responsibility for the provision of prizes is limited to the Prize(s) described in these Terms and Conditions, the Promoter accepts no further liability or commitment beyond those stated and is not liable for any failure of the Promoter’s agents or contactors to supply the Prize(s) as stated. DISPUTES: In the event of a dispute, the decision of the Promoter is final and binding. ALTERATION: Subject to any regulatory requirements, the Promoter reserves the right to alter these Terms and Conditions to address any misinterpretation, misinformation or misunderstanding in the application of these Terms and Conditions, as is permitted by law. The Promoter’s decision will be final. ACCEPTANCE: Participation in the Promotion constitutes acceptance of these Terms and Conditions. DISQUALIFICATION: Any failure to comply with these Terms and Conditions may result in immediate disqualification of an entrant or the Prize Winner. Disqualification will be at the Promoter’s sole discretion. CANCELLATION: The Promoter reserves the right to cancel the Promotion at any time prior to the commencement of the Promotion Period for any reason, including, without limitation, if the Promoter determines that the Competition cannot be conducted as planned or should a virus, bug, tampering or unauthorized intervention, technical failure or other cause beyond the Promoter’s control corrupt the administration, security, fairness, integrity or proper play of the competition. In the event any tampering or unauthorised intervention may have occurred, The Promoter reserves the right to void suspect entries at issue. Any attempt to damage the content or operation of this competition is unlawful and subject to possible legal action by the Promoter.